You are currently browsing the Bookmobile News weblog archives for August, 2015. 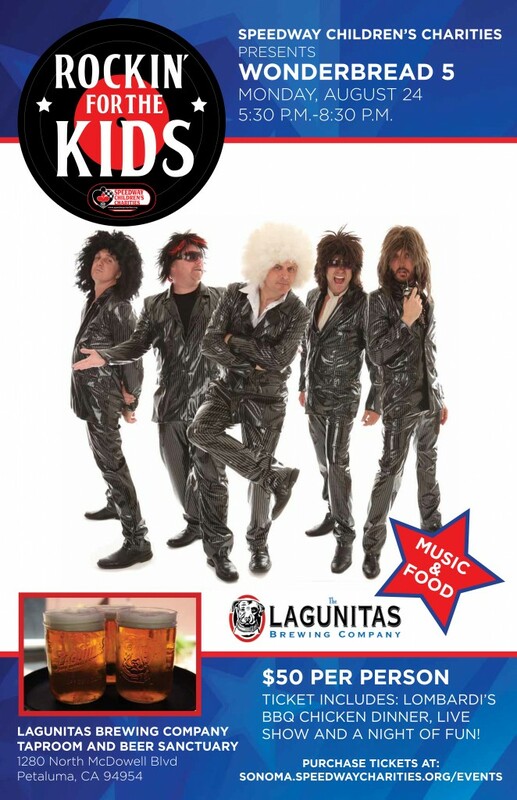 One of the Free Bookmobile’s newest sponsors, Speedway Children’s Charities (SCC), will be Rockin’ for the Kids at its first annual charity concert on Monday, August 24, at Lagunitas Brewing Company in Petaluma. This festive evening, which kicks off the Verizon IndyCar Series championship weekend at Sonoma Raceway, will feature live music from the Bay Area’s premier party band, Wonderbread 5, plus great food and Lagunitas beer. The best part? All proceeds benefit Sonoma County youth groups through SCC, which has distributed more than $4.8 million dollars locally since 2001! For just $50 you can enjoy a live show by Wonderbread 5, and a Lombardi’s BBQ chicken dinner. Don’t miss your chance to rock out for a good cause on Monday, August 24, from 5:30 – 8:30 Pm at Lagunitas Brewing Company (1280 N. McDowell Boulevard, Petaluma). Please see the flyer below and click here to get tickets!